Nestled at the base of the towering Aspen Mountain in Colorado, the St. Regis Aspen Resort is the quintessential Aspen ski resort. Reflecting the grace and charm of a Gilded Age mountainside manor, the luxurious hotel provides an unrivaled base for discerning guests wanting first-class accommodations and amenities, award-winning cuisine, refined culture and exhilarating adventure. Located just steps from Aspen’s signature slopes, the St. Regis Aspen offers uncompromising service and gracious hospitality to ensure an experience like no other. The St. Regis Aspen Resort offers luxurious accommodations, ranging from beautifully appointed standard guest rooms to the ultra-opulent Residence Club and Presidential Suite. All 179 guest rooms and suite are designed for luxury and comfort and outfitted with custom-design décor and furnishings, including leather day beds and desks by Ralph Lauren. Spacious en-suite bathrooms feature marble finishes, double vanities, ample walk-in showers and soaking tubs, plush bathrobes and deluxe Remède bath amenities, and bedrooms have signature St.Regis queen or king-size pillow-top beds with Pratesi linens, down pillows, and designer comforters. Premium amenities and services in every room and suite include flat screen televisions with in-room movies and BluRay players, CD players/radios, digital music, a personalized stocked refrigerator, honor bar and an assortment of snacks, and 24-hour room service. Business services in each room include dial cordless telephones and high-speed wireless Internet, and in-room services include laundry, dry-cleaning and clothes pressing service, twice daily housekeeping, an evening turndown service, irons and ironing boards, glove and boot dryers, a humidifier and in-room safes. Butler services (available in suites only) include complimentary clothing pressing and shoe shine, an unpacking and packing service, and a complimentary morning beverage service. The 1900-square-foot Presidential Suite is the resort’s distinguished accommodation, with breathtaking views from the hotel’s highest floor. Decorated to reflect the interiors of a late 19th-century contemporary mountain manor, the luxurious suite is decorated in subtle tones of blacks, whites and grays, and marble finishes. The suite features a spacious living area with a marble fireplace, baby grand piano and designer furnishings, while the master bedroom and en-suite bathroom have a large walk-in closet, Jacuzzi spa tub and glass-enclosed shower, and a state-of-the-art Bang & Olufsen sound system. Located in a separate wing of the resort, Residence Club suites are two and three-bedroom suites that feature spacious living areas with designer furnishings and fireplaces, fully equipped kitchens, laundry rooms with washing machines and dryers, queen-size sleeper sofas for additional guests and spectacular mountain views. The St. Regis Aspen Resort offers an exceptional epicurean experience with a variety of dining options from casual fare to fine dining cuisine. Enjoy vibrant cocktails and tasty appetizers next to the Fountain Terrace and soak up the magnificent views of Aspen Mountain, or relax next to the crackling fire at the Shadow Mountain Lounge for afternoon high tea or the famous St. Regis Champagne Sabering. The resort’s signature restaurant, The Portal @ TQD offers artistic global cuisine in a comfortable, family-friendly atmosphere, and the Chef’s Club is an innovative restaurant concept where guests can experience the mouthwatering signature dishes created by award-winning chefs from all around the country. The Splash pool bar serves a variety of colorful cocktails and handcrafted cuisine in the stylish lounge next to the resort’s heated outdoor pool, and private dining is available 24 hours a day with selections from the handcrafted menu. The St. Regis Aspen Resort offers a wealth of first-class amenities and services to enhance every stay, ranging from a selection of dining options from fine dining cuisine to casual fare to the full service Remède Aspen Luxury Spa, which offers indulgent and pampering massages and treatments in a tranquil and soothing sanctuary. The Spa features a newly renovated oxygen lounge, steam caves, hot tubs, cold plunges, a fully equipped fitness center, and Confluence waterfall. The resort has a heated outdoor swimming pool and three outdoor hot tubs, which are open year-round and served by the Splash pool bar which serves a variety of handcrafted cuisine, cocktails, and other signature drinks. The St. Regis Aspen Resort is the perfect venue for an unforgettable destination wedding. 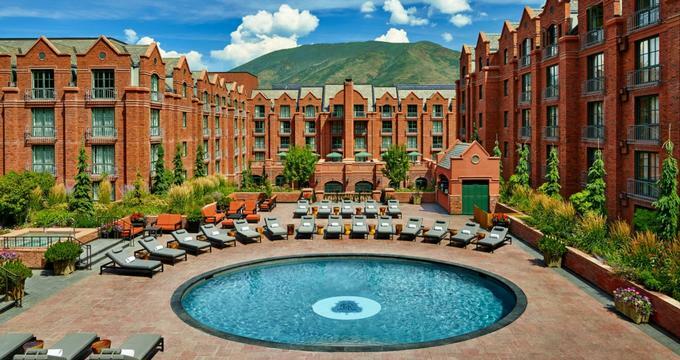 Located at the base of Colorado’s Aspen Mountain and exuding unique historic charm, the legendary resort offers two exceptional venues for ceremonies and receptions, as well as a range of first-class amenities and services to ensure the perfect day. The Fountain Courtyard is set in the heart of the resort and boasts a beautiful terrace with spectacular mountain views for intimate and romantic ceremonies, while the elegant St. Regis Ballroom with its refined champagne hues and crystal chandeliers is ideal for receptions and gala events of up to 600 guests.